Eights yachts racing around the world made an unscheduled stop in Ginowan Marina last week when a storm off Yokohama damaged some mainsails and they could not complete their planned route. They were meant to race from Shanghai to Hong Kong but as Okinawa was about half way, it seemed a good place to put in before the next stage of the race. Eight yachts with 14 crew and one skipper each are taking 11 months to take part in the race, which is sponsored by The Times newspaper in London. They started from Portsmouth, England last October and have so far docked at Villa Mora in Portugal, Havana in Cuba, Panama, the Galapagos Islands, Hawaii and Yokohama. By the time they finish the race next September the 18 meter boats will have crossed the Atlantic three times. Race organizer Sir Robin Knox-Johnston, a well-known British solo sailor, was trying to make radio contact with the group when Japan Update caught up with him at Ginowan Marina. He flies to each port of call to meet the boats and see them off on the next leg of the race. The last he had heard was that they had been 78 miles from Okinawa that morning. “Two are within two miles of each other and three are within three. They’re fighting it out” he said. As it turned out lack of wind slowed the boats and the winner did not arrive until the next evening. “Liverpool” or “the Beatles boat” as Sir Robin put it, was first in at 9.30 pm. 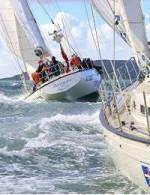 The race takes place every two years and this Times Clipper 2000 Around the World Race is the third such event. The boats are all named after and adopted by British cities: Bristol, Glasgow, Jersey, Leeds, Liverpool, London, Plymouth and Portsmouth. The crews are aged 18 to 64 and about 30% are female with an average age of 35. The men’s average age is about 40. “The crews are all amateur” explained Sir Robin “Forty percent of them never sailed before training for the race. They’re from all walks of life.” Many are business people, though this race also includes a government lawyer and a London taxi driver. “He’s a great character” said Sir Robin of the taxi driver, “although I’m not sure what he does for Britain’s musical reputation after he gets some beers inside him”. The government lawyer, one of the crew of the Portsmouth, 54 year old Paul Brunsdon, said the last two races had been cold and rough. His boat had also been suffering from a leaky hatch. The area around it had been nicknamed “the swamp.” He said the most difficult adjustment from shore life was “living out of plastic bags”. Most of the clipper racers return to their jobs after the event and Sir Robin said it is interesting to see how their characters change after their year at sea. “They tend to have a lot more self-confidence when they return home. Many were in high powered positions before they left and their experience seems to boost their promotion chances significantly. They’ve been out in raw nature, taking life and death decisions. The type of business decisions they made before seem less important, less likely to cause them stress and they perform better”. The clippers and their 120 sailors left Okinawa yesterday for next destinations: Hong Kong, San Fernando in the Philippines, Singapore, Mauritius, Cape Town, Salvador in Brazil, New York and finally home to Jersey and Portsmouth.